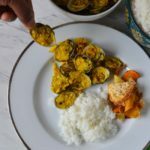 This is a dish that marries two of the abundant ingredients from the Konkan coast – seafood and coconut. Clams in their half shells are liberally coated with coconut and onions. The dish is lightly flavored with spices and the secret ingredient – kokum. Typically they will serve it with steamed rice but I bet a bottle of the local favorite cashew wine, Fenni, will work as well . When we were kids a visit to granny’s place was a must during the summer holidays. She lived right next to the backwaters, so close that the water from the well in her property was salty like sea water. It was one of our pet peeves during those days. As you can imagine this proximity to sea meant an abundance of seafood. Here the Arabian ocean was a big part of every day life – it provided food, raw material for paint, fertilizer, and of course recreation . During one of those summers my sis and I came across a pile of clam shells about 3 ft high. We were very little and 3 feet was a big deal for us. Clams or muscles were not part of our regular diet and till then we had only seen the meat off the shells. So once we figured out what these were it was a source of morbid curiosity. Our summer tradition of these visits to Nanny did continue for few more years. On every visit I made it a point to eyeball the height of the pile. Eventually we learnt that these shells were used to make slaked lime. Whitewash the choice of outdoor paint for ages as it was eco friendly and has mild anti bacterial properties. The shells were collected to make lime. 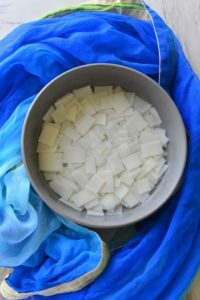 The magic of high heat turns the calcium rich shells into lime (quick lime or CaO) which when mixed with water creates slaked lime ( Ca(OH)2). This slaked lime cures bright white (whitewash) after coming to contact with CO2. For any of you backyard adventure / diy enthusiasts here is a way to make these at home. Whitewash had a tendency to rub off – and was not a favorite of everyone. Over the years modern paints that lasts for few years and those that were mold and mildew resistant became more popular and these piles in the backyards began to shrink and eventually disappeared. That is enough about the shells , it is what is inside that makes clammy weather of monsoons enjoyable. 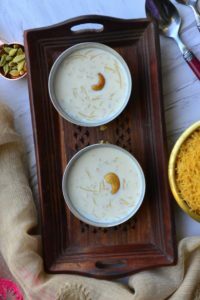 This dish – Tisreo Sokhem – is a typical goan style recipe. Tisreo in Konkani means clams and Sukhem means dry. Dry in this case is an adjective used to indicate that it is not a gravy dish – or curry. 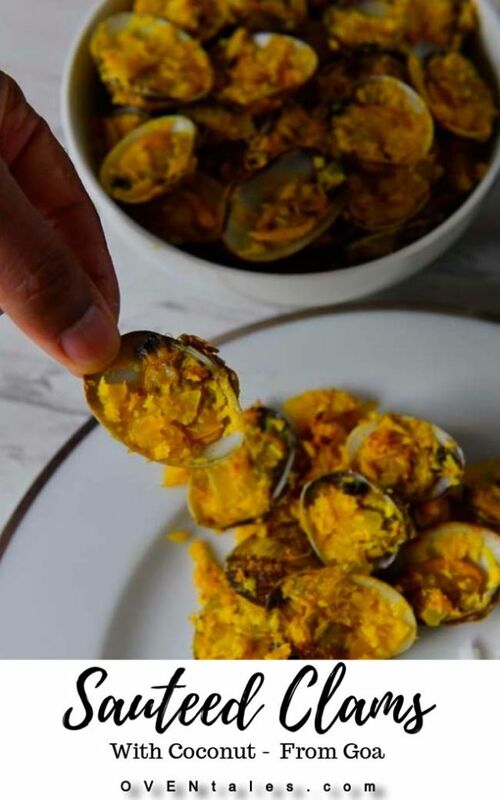 Dry Clams is one way to describe this dish – to be more accurate lets say – dry sauteed clams with coconut and onions. 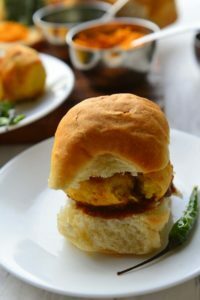 We first tasted this dish a few years back on a road trip to Goa. Somewhere along the Konkan coast we stopped for a scrumptious seafood thali. There was fried fish, fish curry, prawns roast , a dry fish chutney and clams. Even for someone who grew up with seafood this was an incredible experience. The one dish that stood out was this – Tisreo Sukhem or Tisriya masala. the flavors were incredibly fresh and bright – just like that sun that was shining on us that day ! This is my version of the clam recipe . 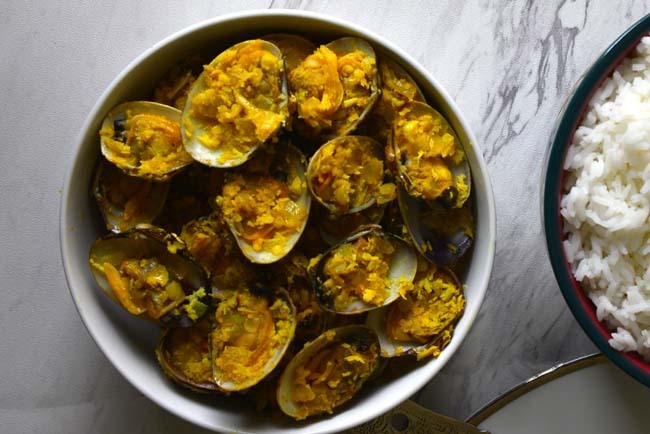 It is an easy dish to make with fresh or frozen clams. If you use frozen clam meat all it takes is 20 minutes from start to finish! My preference here is fresh clams in shell. I like to hold it and eat out of the shell. It is not just an experience reserved for oysters! I steam the clams before stir frying, but I have been told that is not how most of Goa does it. The clams are cleaned and shells are pried open, any unsavory ones get discarded in the process. Whether to remove the meat or leave it in the shells is left to the cook. For some reason, the thought of prying open the clams do not appeal to me, so I take the easy way out. Bring at least 4 Cs of water to boil in pot with a steaming rack set on it. Keep the rack a little above the water level. Once the water comes to a rolling boil place a layer of clams on the rack. Keep the heat high and steam for 2 minutes or just until the clams begin top open. Discard any unopened ones , reserve the rest . Repeat the process with the remaining clams. Why 4 cups of water ? Well to be honest there is no golden rule here. Make sure you have enough water so that the water temperatures does not go down drastically as you place the clams in the steamer. Why not just boil it ? Well you can, but when you flash steam it there is no loss of flavors as in the case of boiling and discarding the cooking liquid. 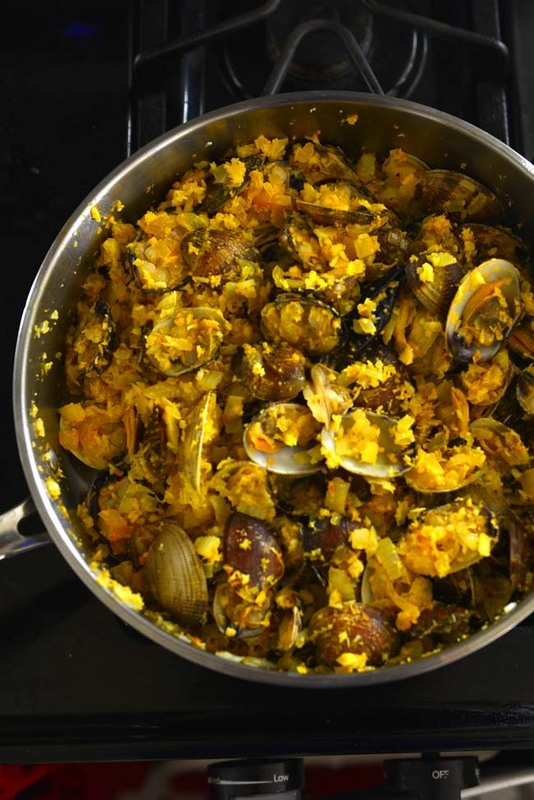 Once the clams are cooked , discard the empty half shell and toss the remaining into the hot mix of onions and coconut ! Stir fry for a minutes , cover and cook for 5 to 10 minutes. Sprinkle a little garam masala on top and serve! There is a secret ingredient here – kokum or Garcinia indica. This may be hard to come by , though many Indian and international stores in the US carry it ( or you could try the global delivery giants like Amazon) . Kokum is the one that brings some tang to this party , but it also adds other subtle flavors. So if you can find kokum use it, otherwise tamarind, lemon juice etc a re good substitutes. There are many ways to create the backyard summer feel – and this definitely is one of them ! These are Goan Style dry clams. 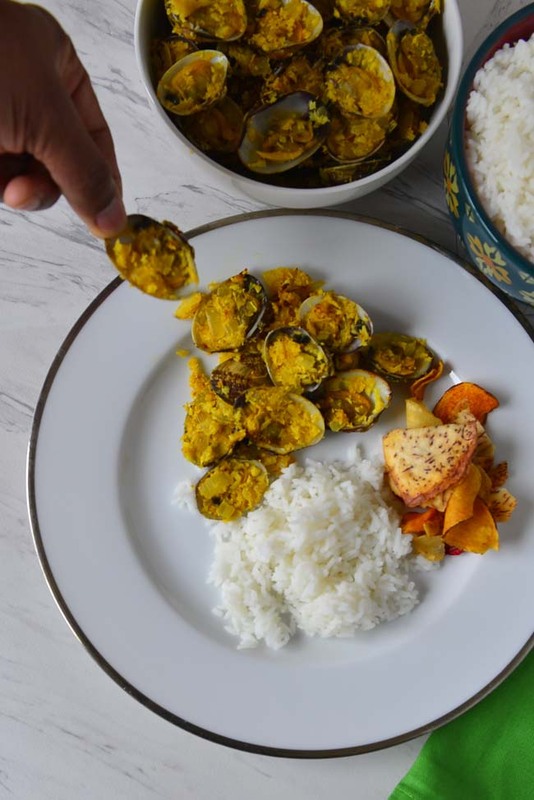 Fresh clams are sauteed with a mix of coconut onion and spices. 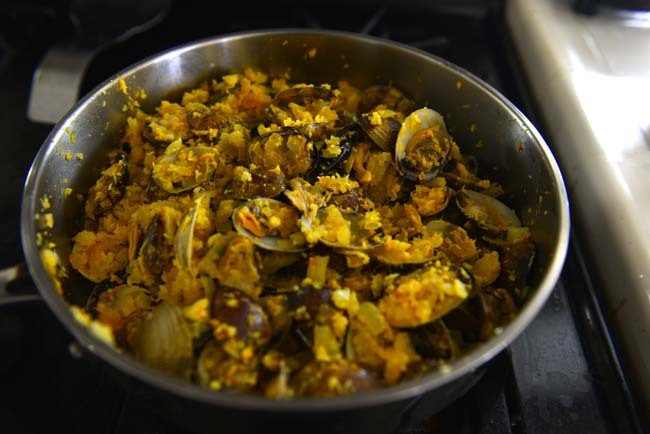 Clams are coated in this mix and cooked just enough to drain the excess moisture. You end up with a juicy clam coated generously with flavors of the tropics. Finely grate the ginger and garlic. Slit the green chilies or for s spicier version chop the onions fine. Soak the kokum in 1/2 C water. Scrub and clean the clams thoroughly under running water. Fill a large stockpot / steamer about 1/2 way with water and add salt to it. Set a steamer rack on top , preferably above the water level. The water should be salty like sea water. Bring it to a boil. When it comes to a rolling boil place a layer of cleaned clams on the rack. Keep the heat on high. In a few minutes (1 to 2 ) the clams should open up. Using a slotted spoon remove the clams and discard the ones that haven't opened . Repeat this process until all clams are used up. Split the clam shells and discard the half shell that do not contain the meat. Heat oil in a large skillet . Add the chopped onions with a pinch of salt and cook till it is soft. Add the grated ginger and garlic along with chilies. Cook for 2 minutes or so until the raw smell goes away. Add the coconut and cayenne and turmeric. Mix and add the kokum and 1/4 C water. Reduce the heat and cook for a minute mixing well. Taste and adjust salt. Add the clams in their shell and mix very gently . Cover and cook over high heat for 5 minutes. Sprinkle garam Masala on top and serve . If Kokum is not available substitute a small piece of tamarind. Soak in in water as in the recipe. When neither is available sprinkle a little lemon juice on top as soon as the clams have finished cooking. Adjust to taste.